Fast shipping, brilliant headband, really warm and with the stretch in it, it fits your head perfectly. In fact I was so pleased with it I am considering buying the matching scarf. I would highly recommend this product and I would also highly recommend this company for the customer satisfaction. This is perfect for me -- nice quality fur, looks great and is very soft and warm. I love that is has fur on the inside too. One note: I have a smallish head and it fits me well. I could see how it might be too tight for larger headed people. beautiful to wear when not wearing my other one it is so warm and cosy very pleased with fit and quality I just love it will be ordering more soon. I love these fur headbands. They are warmer for the ears than hats. I have the bands in two colors. Couldn't get through winter without them. Thank you for this beautiful product, it will be well used in cold weather. LOVE this headband. Perfect for skiing. Fits great, looks great. Very warm and cozy and stylish. Will probably buy one in another color. I purchase two rabbit fur headbands....they are absolutely gorgeous! Thank you so much! I saw this for far more money in Banff at a fur shop - it was over $120 dollars - It is so warm and comfortable and makes a great gift. The fur headband feels and looks great. It's warm and light weight..Received it very fast. Any kind of hair styles go with it. Very pleased. 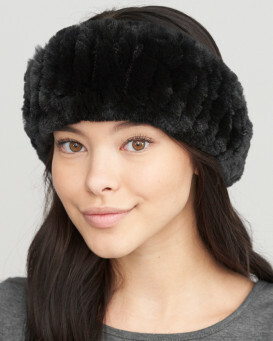 Very nice warm and stylish headband, easy to wear. Great for the snow. When I received my headband on Friday, it was all that and more. As a first time customer....I will order again. Thanks!!!!!!!!! Warm and comfortable and perfect for SF bay sailing. Beautiful, high-quality band. And it is very wide. It will fit any size head because it's very elastic. The quality is outstanding. I bought it because it was on sale. Although high-quality I felt that it was overpriced. I would not have been able to afford it at the regular price but thank God for sales. I bought this for our trip to NY and it was perfect, and so cute on, just as pictured! My wife loves her rex rabbit. Soft and comfortable. Lots of stretch for endless fit no matter the hair style. The black just sparkles. Free shipping got my 5 items to me in 4 days. Fast and accurate along with quality product. I got the hat quickly with great shipping.The shopping was convenient and easy! My sister loves the hat and can’t wait to wear it.It was a perfect Christmas gift. I would definitely order from Fur Hat World again. This is absolutely fabulous. It has fur inside and out and is softly elasticated making it a really lovely and comfortable fit. Matches the fur scarf I bought beautifully. Can't wait to start wearing this over the winter. Ps. Excellent service to the UK. Very fast delivery. I bought this to go with the men's scarf I bought last winter. I can't wear a hat and this headband fits well, just fold it over to make it skinnier. Keeps your ears warm but you don't overheat. 3rd purchase from this company and I highly recommend them.